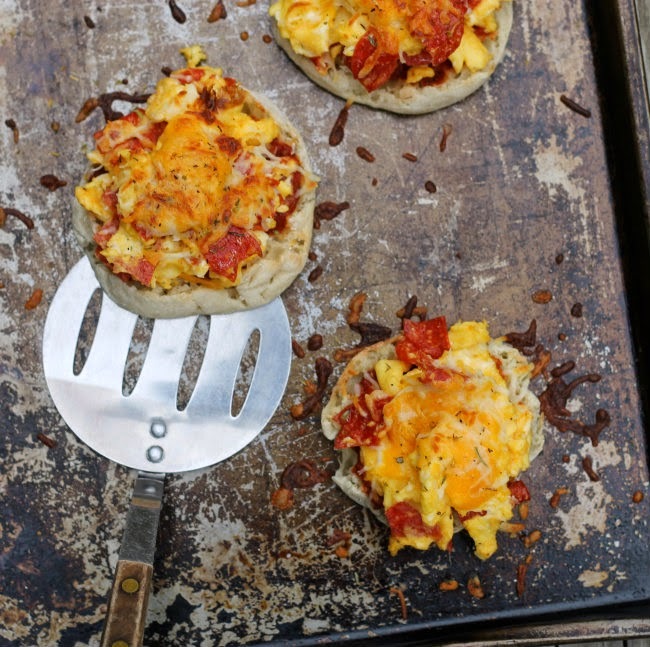 Breakfast pizza… great at any time of the day. Breakfast pizzas have always intrigued me. You know eggs and pizza just doesn’t seem like they should be mentioned in the same sentence. But as I said they have always intrigued me. So I decided that this was something that I just had to give into and see what it was all about. We went on a little road trip last weekend. As I mentioned in a post last week Mike and I share the same birthday which we celebrated last Wednesday. So we decided that a little getaway was in order to do a little celebrating. We left on Friday after having a bite to eat for lunch. Guess what was on the menu for lunch. 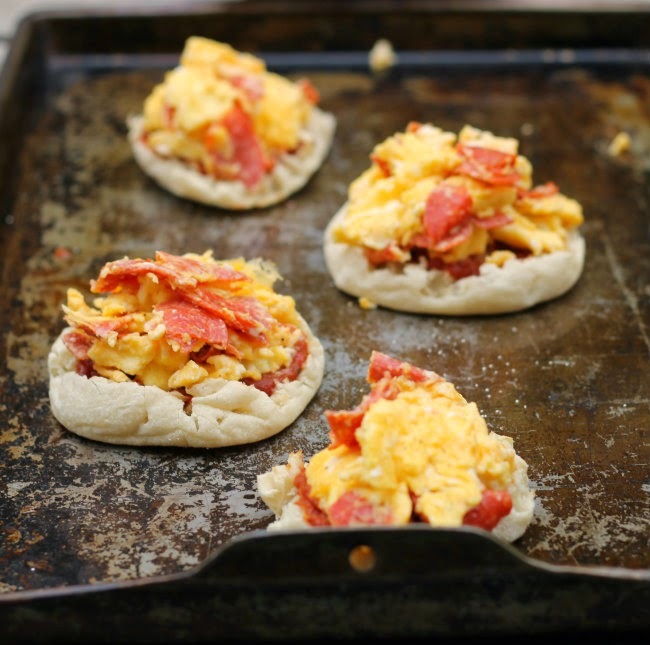 You’re right these breakfast pizzas. Breakfast for lunch… yeah, I am that kind of gal. I love breakfast foods at any time of the day. So as I was mentioning I made these for our lunch, at first I wasn’t quite sure what I wanted to add to the eggs, then I noticed that I had pepperoni in the freezer. I love pepperoni on pizza, so I decided why not on some breakfast pizzas. I never thought of tomatoes and eggs either, until I made my egg and tomato open face sandwich, and you know what… it works. Just like the pizza sauce that is added to the English muffins for these pizzas. The thing about these pizzas you can add what you like best. 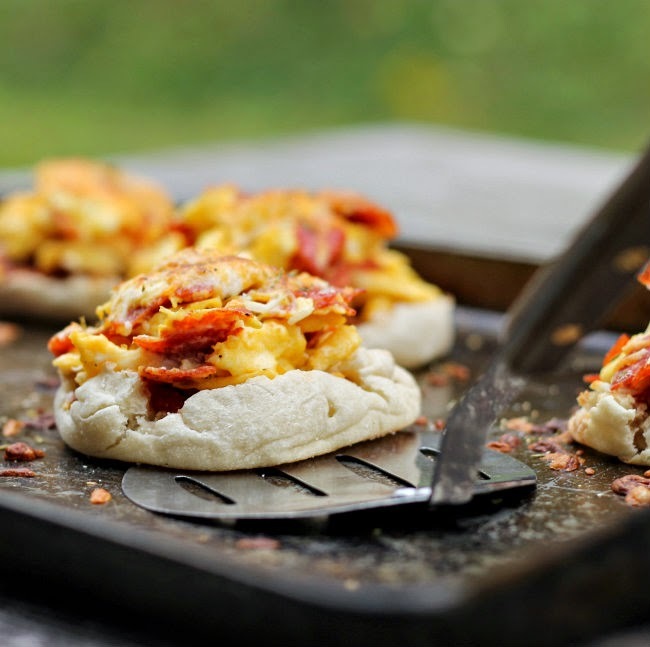 I made these simple, some English muffins, pizza sauce, pepperoni, eggs, cheese, and some seasonings and you have a delicious hearty breakfast or for that matter lunch or dinner, whatever you please. 1. In a skillet melt enough butter to lightly coat your pan. 2. In a medium bowl crack eggs, add milk, and beat until well blended, stir in the pepperoni and season with the salt and pepper. Add the eggs and pepperoni to the prepared skillet. Cook eggs mixture over medium heat until fully cooked. 3. While the eggs are cooking in the skillet toast your English muffins. Once they are toasted place them on a baking sheet and spread 1 to 2 teaspoon of pizza sauce on the cut side of each half. 4. Turn on the oven and get the broiler heated. 5. Once the eggs are cooked divide the eggs between the 4 English muffin sections. Top with the cheddar and mozzarella cheese. Sprinkle with Italian seasoning. 6. Set the mini pizzas for about 2 to 4 minutes or until the cheese is melted and browned lightly. 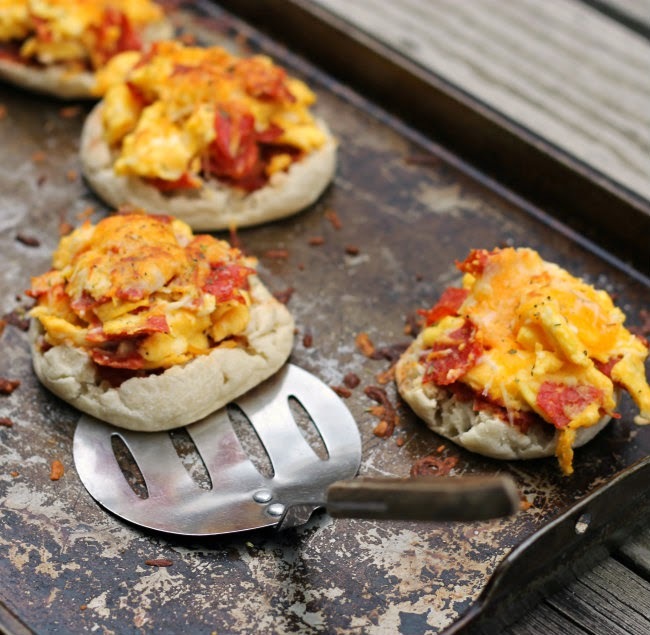 I love breakfast anything…and these English muffin pizzas are so fun! I’m going to have to try these for breakfast. I’ve never heard of a breakfast pizza, maybe I need to get out more. Can’t wait to try this, I think I’ll use Canadian Bacon on mine!